Gabe Polsky has been crafting an eclectic body of work over the last decade. A former Yale hockey player, the young filmmaker has produced films for Werner Herzog and the Emmy-nominated HBO documentary “His Way,” which examined the life of American film producer Jerry Weintraub. He also directed last year’s indie favorite “The Motel Life,” starring Emile Hirsch, Dakota Fanning and Stephen Dorff. 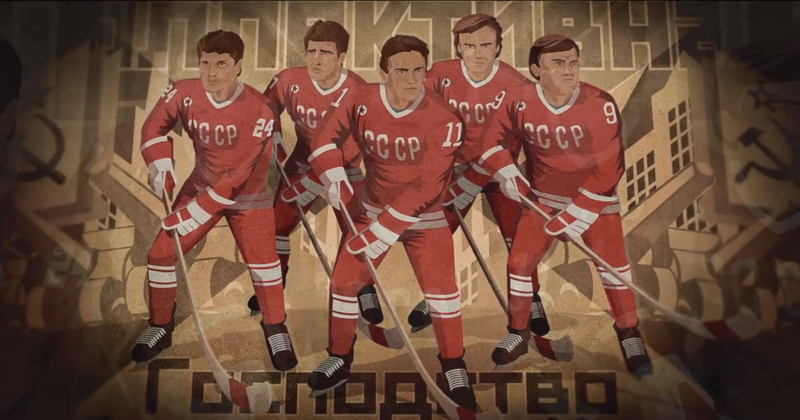 Polsky’s newest film is “Red Army,” a documentary that uses the legendary Russian national hockey team as a lens through which Polsky examines the deeper undercurrents of Cold War Politics. The film focuses on Viacheslav “Slava” Fetisov, the iconic defenseman who acted as the face of the team from the late-’70s through the ’80s, when he became disillusioned with the way the Soviet government used his beloved sport as a political weapon. Slava eventually defected to America, where he experienced no shortage of difficulties assimilating, and has since returned to post-war Russia, where he acted as Minister of Sport and now holds a position in the upper house of the Federal Assembly of Russia. The film is spurring serious Oscar buzz and had its premiere Monday evening at the Landmark Sunshine Cinema in the Lower East Side. Indiewire spoke with Polsky before the screening and the filmmaker also participated in a Q&A after the screening. Former intelligence operative Lindsey Moran moderated; she noted that there were other former CIA agents in the room, but she declined to recognize them for obvious reasons. Joining Polsky on stage was retired Canadian hockey pro Rod Gilbert, who played against the Soviets in the 1972 Summit Series. He said that he considers that series to be the highlight of his professional career, though he felt like, “[they] shamed the country by losing” to the Soviets. He described their style of play as “cheating,” further elucidating on the difference between Western and Soviet playing styles as highlighted in Polsky’s film. “Red Army” makes discernible not only the significant difference in playing styles between the US and the USSR, but the way the two teams, and the nations in general, viewed the other’s style, and how those styles reflect national interests. In one clip, a pair of U.S. sports broadcasters circa the mid-’90s say the Russians play unfairly and unwisely, passing when they should shoot and skating fancy instead of being aggressive. The Russians criss-crossed frequently and were notorious for their uncanny ability to pass with apparent blindness to a teammate. Slava, in turn, says that the Americans had no style, no grace and no team work. Also in attendance was Alexei Kovalev, who in 1991 became the first Russian player drafted in the NHL. He appears in a crucial moment in the film, where Polsky uses some clever editing to show that money really was the absolute authority in the Cold War as well as hockey. Kovalev played for the New York Rangers for most of the ’90s. Considered one of the all-time greats—Polsky called him one of the most talented players of all time and said “Players like him are why people watch hockey”—he briefly spoke from his seat in the audience. All evening, people seemed to be flitting around Russia’s disconcerting activities as of late, and the reign of Vladimir Putin, who is, according to Moran, “Bringing back the Cold War.” But no one really dug any deeper. So Indiewire asked Polsky if plans on screening the film for Vladimir Putin. “I’ve been wondering about that,” he said. I know he’s a hockey fan. I don’t know, but I’d like him to see it.” He was quickly called away to pose for photos, unfortunately. Sony Pictures Classics opens “Red Army” November 14 in select theaters. It expands in January.